Carte de Visite of Cataline Mead Parent, taken by E. B. Ives, Photographer, Niles, Michigan. 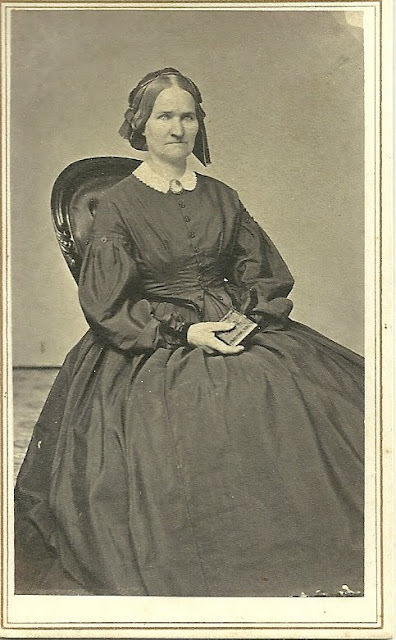 It's possible that this lady was the wife of James L. Parent, who was born about 1815 in New York, died about in Michigan. If so, she was born about 1815 in New York. The 1840 census shows a James Parent living in Galway, Saratoga County, New York. In the 1850 Census, he's living in Berrien, Michigan, with his wife, whose name is spelled differently in every Census I checked, none of which is exactly the same as what is shown on the reverse of the CDV. It's possible that the ID on the CDV is incorrect, but I would tend to give it more weight. James and Cataline had at least two children, George and James, born in the 1840s. 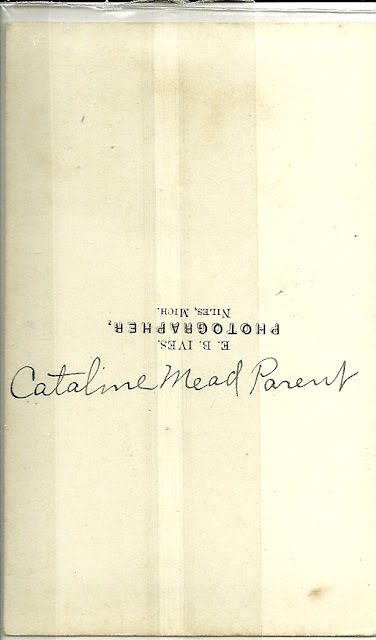 I wonder if Mead were Cataline's maiden name or a middle name. The only clues to her parents are that she indicated on the 1880 Census that her father was born in New Jersey and her mother in New York. If you have any insights into the families of Cataline and James, please contact me.